Opponents of the Shinawatra political clan campaigned triumphantly in the Thai capital on Sunday, after a weekend of high political drama when a Thai princess’ bid to be premier provoked a rare royal rebuke. Thai Princess Ubolratana’s unprecedented attempt to become prime minister of Thailand was scuttled after her party agreed to comply with a command from her brother King Maha Vajiralongkorn on Friday, opposing her move to contest the upcoming election. The Thai Raksa Chart party, affiliated with the powerful Shinawatra political clan, had announced the princess as their candidate Friday morninga move which rattled the status quo and threatened the ambitions of the generals in power. Members of the Phalang Pracharat partywhich is aligned with the militarywere jubilant following the weekend’s upheaval and its party leaders took to the streets, campaigning in a 60-vehicle convoy, to tout their tradition-abiding credentials. “We won’t work with a party that is not like us: respecting the laws… traditions and Thai customssomething that Thai people are very strict about,” party leader Uttama Savanayana told reporters Sunday, in a reference to the Thai Raksa Chart party. “We take this seriously! This isn’t a play!” said Buddhipongse Punnakanta, a party member who recently left his position as spokesman for junta leader Prayut Chan-O-Cha. 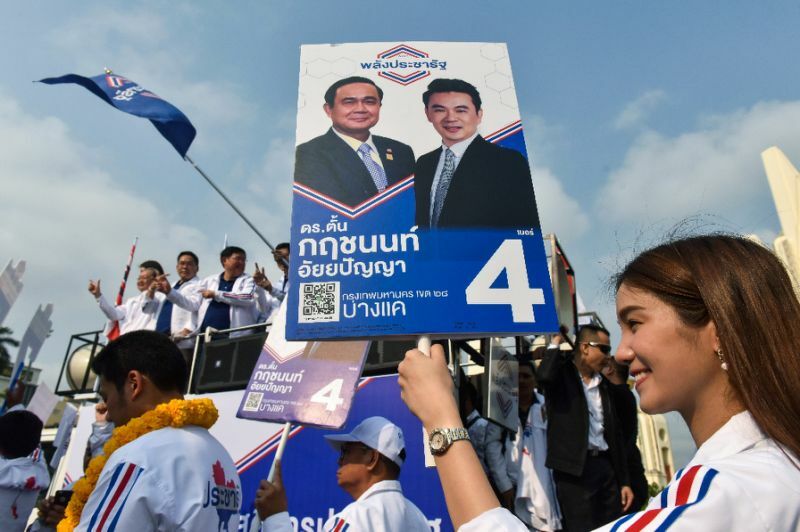 Prayut announced his interest in staying on as prime minister on Friday, submitting his candidacy under Phalang Pracharatbut the move was overshadowed by Thai Raksa Chart’s unorthodox candidate pick. The Association for the Protection of the Constitution plans to file a petition to the commission to “investigate if Thai Raksa Chart Party’s nomination of Princess Ubolratana is lawful and constitutional”, said chair Srisuwan Janya. “If (the commission) finds it to be unconstitutional, they should submit a case to the constitutional court to dissolve the party,” he told AFP. A day after the party’s swift response saying it “complies with the royal command” to retract the princess’ candidacy, Thai Raksa Chart issued a statement Sunday saying their party policies remain unchanged. “We will keep moving forward in the election so that we can solve the problems for the people and country,” the party said in a statement posted on Facebook.